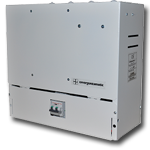 We supply Emergenzamatic - Emergency rescue devices. 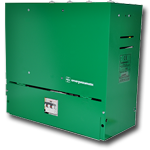 These devices are useful for traction and hydraulic lifts. This device in the event of lack of main supply voltage or electrical failure in the control panel releases the trapped passengers bringing the car to the nearest or prefixed floor and opening the doors. The device operates and switches off automatically and is especially aimed at buildings without concierge service or with large influx of public (hospitals, airports, subways, stadiums, etc...) where in case of emergency it is recommended to take the car to a specific evacuation floor. The devices 43/E series, designed according to the new criteria “green future”, are easy to Install, with a system learning the parameters during commissioning and a new method of engine management which ensures at any intervention a reduction in consumption of Battery life (up 80%). The batteries used are 12V sealed type, and their number depends On the rescue operation (to the nearest or specific floor) that the device is requested to Perform, it is possible to insert from 4 to 10 batteries (usually with capacity 7,2 Ah or 18Ah). For information on the usability of emergency rescue devices and sizing of a suitable application-specific model, do not hesitate to contact us.